As the son of a journeyman hockey player and eventual coach, Buffalo Sabres newly acquired forward Tage Thompson became accustomed to never staying put in one place for too long. BUFFALO, N.Y. — As the son of a journeyman hockey player and eventual coach, Buffalo Sabres newly acquired forward Tage Thompson became accustomed to never staying put in one place for too long. "I'm not sure the amount of states I've lived in," Thompson said Monday, in recalling how he attended nine schools by the time he began his junior year at a high school in Michigan. "Almost a new school every year," he added. "So, I've moved around quite a bit." His father is Brent Thompson, who is the coach of Bridgeport in the American Hockey League. His career included numerous stops from playing for the AHL's Hershey Bears in Pennsylvania to coaching the ECHL's Alaska Aces. It's been a similar life of travel for the 20-year-old Thompson in the two years since being selected by the Blues in the first round of the draft following his freshman college year at UConn. 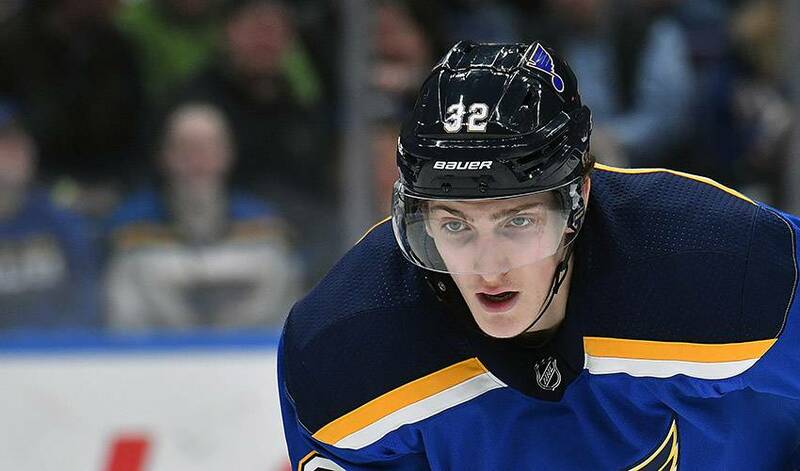 Upon splitting last season between St. Louis and the Blues' AHL Affiliate in San Antonio, Texas, Thompson is headed to Buffalo. He was acquired along with two veteran teammates and two draft picks on Sunday, in a deal that sent centre Ryan O'Reilly to St. Louis. "I feel like I've been living out of a suitcase, honestly," he said. "I really do hope Buffalo's it." The Sabres are counting on it after Blues general manager Doug Armstrong said Buffalo insisted Thompson be included in the trade. The Sabres also acquired centres Patrik Berglund and Vladimir Sobotka, as well as a conditional 2019 first-round pick and a 2021 second-rounder. In Buffalo, he'll get a shot to earn a spot on one of the top two lines on a team rebuilding through youth. "What we see in Tage is a kid who has a great shot, great size, and a really good reach on the ice," GM Jason Botterill said. "I think he's a player that's going to be able to step into our lineup and grow with our young centermen." Thompson can't wait, and recalled how he was with his father when Armstrong called to inform him of the trade. "The more we sat and thought about it, we felt it's a great fit for me," Thompson said. "It's going to be exactly what I've been looking for as far as an opportunity to go in and play a lot and produce, and help the team win."